Seen from the Loch Hope road. The Loch Hope road (often just the Hope road) is a 32km (20 mile) minor road in Sutherland between Altnaharra NC5635 and the north end of Loch Hope NC4760. Its number is C1034. It is long and often winding, with very few passing places. Fortunately, apart from the few residents, it is normally used only by fishermen and by walkers wishing to climb Ben Hope, which at 927m (3040ft) is the most northerly Munro. Starting from the north, it runs for about 10km on the east side of Loch Hope. It then continues south in Strath More for a further 8km, passing the normal start point for the Ben Hope climb (at Muiseal, NC4647) and the well-known Dun Dornaigil Broch (at NC457450). 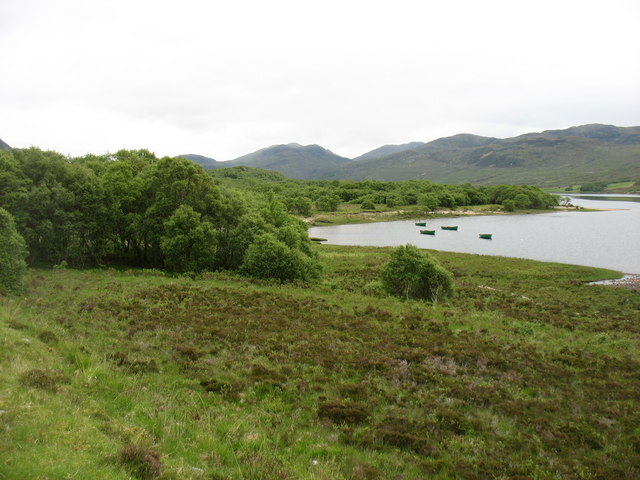 It then turns south-east away from the strath, passing the southern end of Loch Meadie (a popular trout loch). Veering even more to the east, the last few kilometres to Altnaharra are marked by areas of forestry. Most of these have now (2015) been felled, and if there is one thing worse than regimented Sitka, it is the debris left behind afterwards! The photos taken on 24/25 June 2015 were taken on a north to south trip. The weather was not brilliant, but fairly typical. (Most, but not quite all, are taken in the direction of travel, i.e. south or east. I have submitted them in geographical order, not order of taking.) It is indicative of the traffic on this road that during a three-hour photographic trip I encountered three vehicles: one, a car approaching (fortunately near a passing place); two, the Post Office van, which went by while I was visiting the Broch; and three, a car parked at Loch Meadie while the driver read his newspaper!